Cricketing legend Max Walker’s company Maxximiser, has joined the throng of Australian developers aiming to hit it big on the popular iPhone releasing an app for the the race that stops a nation. Walker has teamed up with the Victoria Racing Club (VRC) to deliver the official Melbourne Cup Carnival iPhone app. In September, Apple said it has passed 2 billion applications downloaded from its App Store, and that there are now more than 85,000 apps available to more than 50 million iPhone and iPod Touch users worldwide. Walker's app has nine features to keep punters around the country with their pulse on the latest news and results from the Spring racing carnival. An electronic form guide generates up-to-date information from Racing Information Services Australia (RISA) on all upcoming races, jockeys and horses, and official news is generated from the VRC website. The fully interactive app also has an office sweep organiser and the opportunity to submit your Cup pictures online for others to share. Last month Melbourne-based Firemint announced that its six-month-old, top-selling iPhone application, Flight Control, reached over 1.5 million sales, in what has been a busy year for the Australian iPhone app market. Developer Graham Dawson, who hit iPhone App Store success with his Oz Weather app, also released a new Sun Seeker app earlier this month. 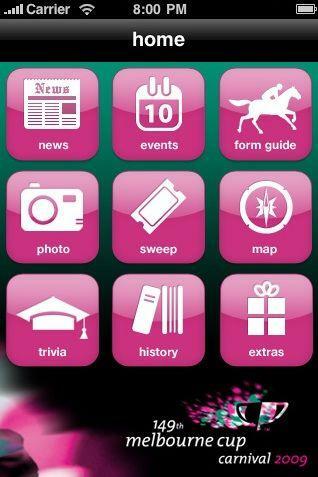 The Melbourne Cup Carnival app is available to download now for $3.99. Are you an iPhone app developer?Email Computerworld or follow @computerworldau on Twitter and let us know.